A sea tourism fes tival will be held in Do Son District of the northern port city of Haiphong from April 28 to May 6. The festival will serve as the framework for many cultural, sports, and tourism activities, including the Do Son Open tennis tournament, a cycling race, dragon boat racing, and a paragliding performance. The local administration has improved the quality of tourism services by opening training courses for guides and drawing up plans for security and food hygiene and safety. Do Son District currently has 135 accommodation facilities totalling 3,474 guest rooms—one four-star hotel, one three-star hotel, six two-star hotels, and 44 restaurants. 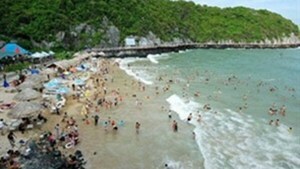 Along with Cat Ba, Do Son is one of Haiphong’s most popular destinations for domestic and foreign tourists.